I’m from Lawrenceville, New Jersey. This program was the only one I applied for in Canada, and I’m glad that I chose it as my home for 5 years. It has taken me into areas of research I never expected to go into, and I still get excited at the possibilities of where my research experiences here could take me in the future. I swear that no one has paid me to say that. I’m in Michael Inzlicht’s lab at UTSC. 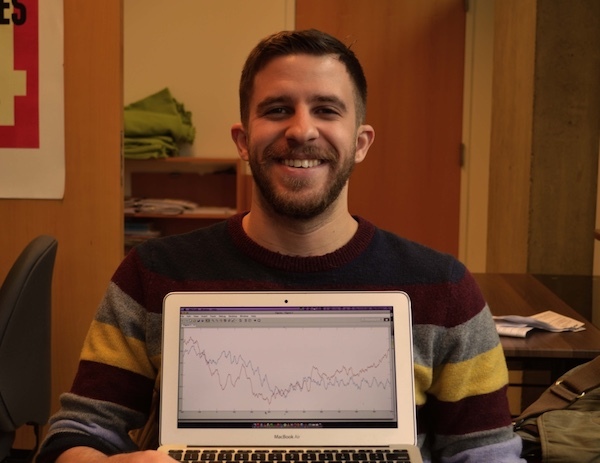 I use EEG, EMG, behavioral measures, and experience sampling to study how emotions facilitate and influence cognitive control and self-regulation. Members of my laboratory use a “social neuroscience” approach, combining techniques and theory from both social psychology and cognitive neuroscience to understand how people and their brains control their behavior and make decisions. Right now I really want to learn more about how to use computational modeling and Bayesian cognitive models. My experience with both of these techniques right now is pretty rudimentary. The amount that I do understand, however, is enough to get me excited about their future use in psychology. Ted Chiang’s Stories of Your Life and Others. One of his stories in this collection was recently turned into the movie Arrival. Both his stories and the movie are great! I would be doing the same thing as my twin brother — playing music in New York City.